Food. It’s part of our lives every day. We shop for it, stash it in the fridge, and pop it in a pan with little thought of the steps that go into the journey from seed to salad, from farm to burger. After all, it’s not rocket science, right? Not so fast. The truth is, most of us have no idea how much ingenuity and dedication goes into making our food safe, healthy, affordable, and appealing—and four scientists from Umass Amherst’s acclaimed Department of Food Science are receiving international honors for doing just that, in very diverse ways. It’s part of what makes the department’s Ph.D. research program the best in the nation, according to the National Research Council. “People don’t realize what a complicated material food is,” says Professor Julian McClements, whose contributions toward technologies that promote public health through nutrition earned him this year’s Babcock-Hart Award from the Institute of Food Technologists (IFT), the world’s premiere food science association. “I’ve always been interested in using applied physics and chemistry to improve human health, wellness, and quality of life,” says McClements. During his 20 years at UMass Amherst, his work has focused on “trying to understand the physical chemistry of what happens inside the body after you consume food and change the way food reacts in the digestive tract,” he explains. McClements’ research has resulted in new strategies to create reduced-calorie foods with the taste and mouthfeel of higher-fat foods, in an effort to fight obesity and related diseases. He has also developed nanotechnology-based approaches to develop delivery systems to encapsulate, protect, and release vitamins, nutraceuticals, antimicrobials, colors, and flavors. A number of these approaches have already been adopted in commercial food products. Nugen is tackling the problem of bacterial contamination by designing tests that are quick, portable, inexpensive, and easy to use. The result would allow producers, from small farmers to food production plants, to know immediately whether their products are safe, avoiding the waste, loss of freshness, and potential pathogen exposure that comes from waiting days for test results. Nugen has discovered a way to use magnetic nanobot viruses to attack E. coli and other bacteria and insert a gene that produces a characterizing enzyme. The bacteria can then be “yanked” out of the solution, resulting in a more concentrated sample that makes detection easier. “We take something that’s existed in nature for thousands of years and re-engineer it,” says Nugen. “A virus is a lot cheaper than getting antibodies in a lab, and we can replicate it in no time.” The point-of-use test Nugen is developing will be a boon not only to domestic farmers, who are facing more stringent standards from regulators and retailers, but also to growers in low-resource settings such as developing nations. Food safety and quality is also the focus for associate professor Julie Goddard, who received IFT’s 2015 Samuel Cate Prescott Award for outstanding researchers in the early stages of their career. Goddard is working at the intersection of food science and material science to design coatings and new materials to make improve the safety, quality, and sustainability of our food supply. “Beyond packaging, our food comes into contact with a lot of materials in the harvesting and processing of food,” says Goddard. These include surfaces used in display cases, rinsing bins, cutting boards, and equipment like heat exchangers used in pasteurization, all of which can be a source of microbial cross-contamination that can lead to outbreaks of foodborne illness. To respond to this health threat, Goddard is developing coatings that are antimicrobial and non-fouling, thereby reducing risk, food waste, and the need for chemical cleaners. Park works with edible oils, specifically conjugated linoleic acid (CLA), which she discovered its ability to reduce body fat. She’s now building on that breakthrough to determine whether CLA can also help increase muscle mass by promoting activity. Animal studies have shown that CLA modulates muscle metabolism, leading to better outcomes from exercise. More trials are needed, but experiments with young animals suggest the possibility that CLA may help lower the potential for obesity in children. This beneficial fatty acid has been approved as an additive by the Food and Drug Administration, and Park expects to see it enriching such foods as dairy products, orange juice, and energy bars. 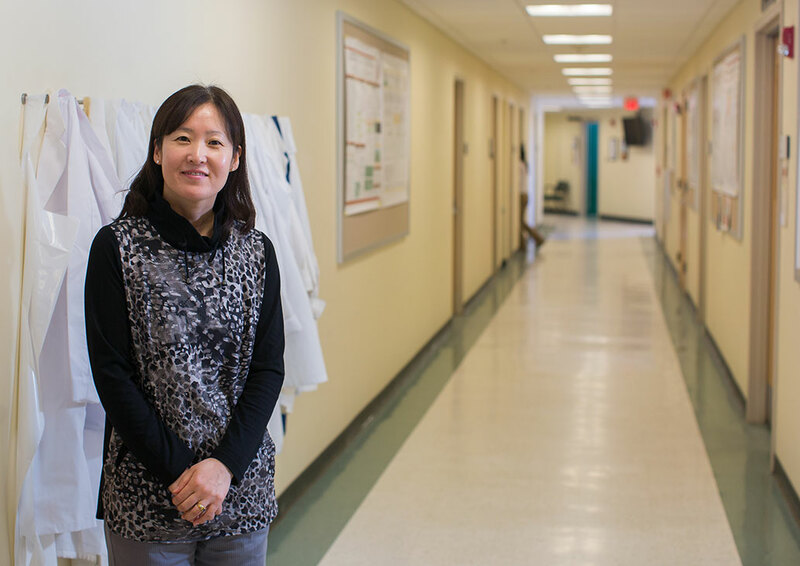 In her quest to combat obesity, Park is also studying potential links between environmental contaminants such as pesticides and weight gain—work that grew out of idea sharing and collaboration with researchers in the UMass Amherst Department of Veterinary and Animal Sciences.